The entrance to Charleston Harbor is between converging jetties, the inner portions of which are submerged. A Federal project provides for a channel 47 feet deep over the Bar (Ft. Sumter Range) and through the Harbor entrance, and thence 45 feet deep into the major reaches of the Cooper River, Wando River and Goose Creek, 13.6 miles above the mouth. Channel widths are generally 1,000 feet offshore, 600 feet in the Cooper River, and 400 feet in the Wando River. 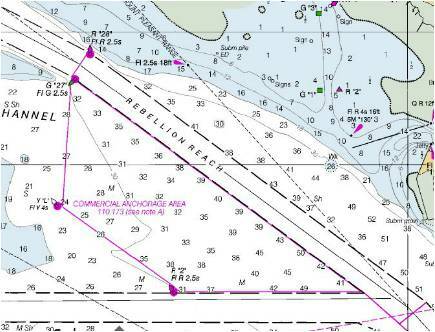 When inshore vessel anchorage is needed for bunkering, marine services and the like, the principal anchorage is the triangle westward of the junction of Rebellion Reach of the main channel with South Channel. The anchorage is currently restricted to a maximum draft of 28 feet. If there is a need to anchor offshore prior to coming in to port, many vessels drop anchor a mile east of the “C” buoy. Tune in to NOAA Weather Radio Charleston on WX 1 (162.55 MHz). Fog in Charleston Harbor is seldom. In the case that fog results in less than a half mile of visibility, the first board pilot may decide it is not safe for vessel movements and shut down port traffic until conditions improve. When traffic resumes, we generally start with one-way traffic, with outbound moves followed by inbound. The Coast Guard and Ports Authority are notified when a shutdown occurs. If you feel your vessel will be affected by fog or other weather conditions, please contact our office directly (link). Please check back for updates when extreme weather or hurricanes are affecting Charleston. *Click here for real-time NOAA air gap reading at the Don Holt Bridge. Note: The content on this page is for reference only. Charleston Branch Pilots’ Association does not guarantee accuracy of the information on this website. All navigational decisions remain the responsibility of the master and should be based on official resources. Please contact dispatcher before arrival or departure for accurate voyage planning.